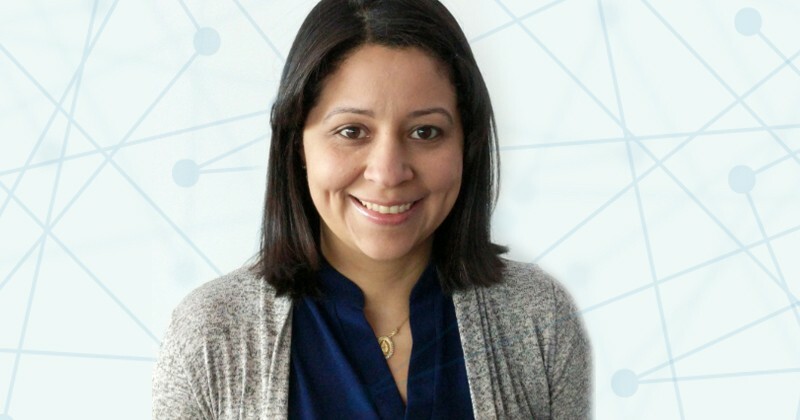 When Priscilla Moraes moved from Brazil to Newark, Delaware, her husband was pursuing a doctoral degree in computer science at the University of Delaware. Moraes already had a bachelor’s degree and a master’s degree in computer science, but a doctoral degree seemed out of reach. She couldn’t speak English, so she started taking English classes at the English Language Institute. In spring 2010, she began study in the doctoral program in computer science, while she was expecting a child. She earned her doctoral degree in computer science from UD in 2016. Now, Moraes is a machine learning specialist at Google. She will share lessons from her journey in a CIS TED Talk on Friday, Oct. 5, 2018 at 3:30 p.m. in Mitchell Hall, as part of the 55th Anniversary Celebration of the Department of Computer and Information Sciences. UDaily asked her a few questions about her journey from Brazil to UD to Google. Q: What made you decide to come back and give this talk at UD? Moraes: UD has made a really big impact on my life in terms of career development and applying the skills I have today. Most of the things I’ve been able to accomplish today has been due to the education, confidence and support I received at the University of Delaware. Q: How did the department give you confidence and support? Moraes: I don’t like to bring up the topic of diversity all the time, because sometimes it feels like we just go over and over it again and again. But I think it’s really important to mention it, the fact that I’m a minority in the field of computer science. (Latina women make up only 2 percent of employed computer scientists, according to the National Science Foundation.) A really small percentage of computer scientists are women, plus being Latina, all of that plays a role that makes it harder to get to the place that you want to be, to be successful. At UD, I felt that the environment was really inclusive, which I will discuss in my talk. It was inclusive in many different ways. I came to UD with my husband, who was pursuing a doctoral degree in computer science, so I didn’t originally come to go to school. I didn’t speak English when I got there. About a month after we moved to Newark, I was invited to a lunch with the CISters group, the group for women in computer science. I was amazed by the number of smart, empowered women there. I wished I could have understood what they were saying in the meeting! They were so warming and welcoming even though I couldn’t speak to them. They were supportive, and I fell in love with the group at the moment. That specific day, that lunch meeting, made me realize I could do it. I would be welcomed. The confidence of that day, that lunch meeting I had with them, is with me today, not only because I realized I could be one of them, but also because I started the PhD program pregnant, and the support that I received from the department, from the whole school, was amazing. I went through my preliminary exams for the doctoral degree, and I got to do my research, and all of the faculty were really understanding. Both of my advisors, Dr. Kathleen McCoy and Dr. Sandra Carberry, were instrumental in my development and success. They are true role models. That increased my confidence that I could do it. I could still be a Mom. I could still finish school. It’s hard to put it into words, but it was just the interaction with the faculty and staff, and the way they made me feel, that gave me confidence that I could do it. Vera Wagenfuhr, who today is a dear friend of the family, helped us in the very first week of our new life at Newark with her amazing work in favor of international students. Her support was invaluable. That’s why I’m here today, the feeling of empowerment that I could gather from the community at UD. Q: What was it like to move to Newark from Brazil? Moraes: It’s hard when you move to a place and you kind of lose your identity. I wasn’t me anymore. You lose your network. I didn’t have my job. I couldn’t even communicate well at the grocery store. These were things that I took for granted back in Brazil. I attended a computer science class by Dr. John Case, and even though I couldn’t understand, I just wanted to feel that feeling of being in class. So I told my husband, I wanted to go sit and watch one class. At the time, I could understand the math but I couldn’t understand the language. I told my husband I would never be able to enroll, even if I wanted to. I wouldn’t be able to follow the classes. But I started anyway, and it was amazing from beginning to end. When I look back and think of what my life would have been if I hadn’t decided to just take the leap, if I hadn’t decided to accept the invitation from Dr. Martin Swany (my husband’s and my own advisor at the very beginning) to start the program, it would have been completely different. I know that there are many great schools out there, but it’s just the combination that makes UD special and unique. It’s not just about the curriculum. It’s not just about great people. It’s all of that together, and that makes a big difference. 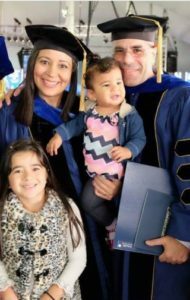 Priscilla Moraes and her husband, Marcos Portnoi, celebrated their doctoral graduation from UD with their daughters in 2016. Q: What was it like to earn this degree at the same time as your husband? Moraes: We did this as a family and walked together at graduation. There is a picture of him and I with our gowns and our two daughters, 7 and 1-year-old at the time. The day of my dissertation defense, I was seven months pregnant. The opportunity to walk with my husband was amazing. He is my best friend and the love of my life and we got such an accomplishment together. Q: What would you tell someone else in your position who wants to study computer science? Moraes: It might sound cliché, but don’t give up. It might get really hard, but don’t give up. If you’re trying to do things that people don’t expect, you might hear that it’s hard and difficult. When people learned that I was pregnant and starting the program, they said: You’re probably crazy. I wouldn’t do that. For women and in general, there will be roadblocks. There will be barriers. I believed in myself, but I also grabbed every single rope that was thrown my way, and I think that’s key. We need each other. We need support. We need a partner who encourages us and helps us get there. I became a member of Women in Engineering (WIE). I was the co-chair for the first year and then the chair for the second year. You start building a network, which is really important. Make sure that you belong, and that you feel that you belong, because you really do, but we kind of have our responsibility and our homework to do on that end. If we don’t believe in ourselves, it becomes harder to handle everything that comes our way. Today, getting the skills to do our work is important, but we also have to develop the social, people skills by interacting, making friends, and embracing your home. Especially being an international student, it’s hard because you feel that your world changed, literally. It’s not just geographic. Your reality is now completely different than what you grew up with. Embracing it as your new home makes it easier to be ready for the challenges. Q: What do you today at Google? Moraes: I’m a machine learning specialist. We are charged with enabling customers and partners to do whatever they are doing better. In my case, my role and my goal is to enable customers to do machine learning and artificial intelligence in a better way for their businesses. By that I mean teaching them, giving workshops, training data scientist teams and development teams that work on projects related to machine learning, and be an advocate for the services and offerings that we have on the cloud platform for Google. Q: How did your coursework at UD prepare you for this role? Moraes: Most of the work I do today is related to Natural Language Processing. I enable customers to leverage Google’s powerful NLU (Natural Language Understanding) Machine Learning models. Dr. Kathleen McCoy, who has been a mentor, advisor, and friend, was my professor in NLP and NLG. She provided me with a background in NLP and Linguistics that are key components of what I do today. Google developed its own accelerator, a chip, specific to process machine learning workloads. For the code to run on that, we need to compile the code. When I’m talking with customers about that, I remember Dr. Lori Pollock’s talk on compilers, and it helps me to have those discussions. When we talk to customers about the massive networking capabilities of Google, and how widespread we are nationwide with our fiber underseas, I remember all of my networking classes with Dr. Chien-Chung Shen. Designing efficient and reliable algorithms is something really important at Google, at any engineering level. Dr. Errol Lloyd was one of the most amazing algorithm teachers I’ve met. And I had algorithms back in my master’s, back in undergraduate school, but I still remember things that he mentioned in class. The way he made it natural, not just like one more class, I carry that with me today. I carry with me the thoughts of how to go find the answers to my problems and answer questions when they arise because of the experiences and interactions with the professors there. That definitely gave me all of the technical skills I need today, and I still use them. Even though these examples are not related to machine learning, they are there. From the core courses, they follow us wherever we go, whatever we do. The opportunity to teach also gave me confidence to speak in front of customers. In the summer, I taught a class of my own, an introduction to computer science for engineers. And that again was key for me to kind of get the method, to be able to teach, and that’s a lot of what I’m doing today—enablement. The TA experience, the teaching experience, all that gave me a set of skills that I use today. Q: What is the most important lesson for today’s computer science students? Moraes: Don’t forget the ethics piece. We’ve been seeing a lot of things today in machine learning, we’re not teaching computers to be human enough. We should. And we need true humans to think about things like the golden rule. We need to think about the golden rule when we develop algorithms, when we decide what our next job is going to be, when we decide how the systems we design will serve people, because that’s what they’re made for. Never think about them as ways to replace humans, but as partners. We can do that if we remember things in whatever we do, the golden rule. That’s the way I’m going to design my system or program and go about teaching the science once I get there. That’s how I’m going to do my job every day and make sure that what I create is a benign and powerful tool to help other people.